Ask fellow campers about "Fish House Inn and RV Park" and nearby attractions. Question: How busy is the RV park in July? How far in advance should I make reservations? Answer: There are only 10 spaces, so make your reservations as soon as you can. Lots of good stuff to see around there, so I'm sure it is busy then. This is a very nice small RV CG. We stayed in an overflow site and only had 30 amp power hook up and it wasn't that level we had to add 3" of boards to level out. Roads are gravel as are the sites and it's a snap to get around in. Showers and bathroom were spotless, The showers had good pressure and hot water. 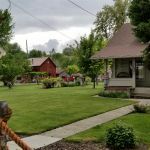 You're located right in the heart of Dayville and it's any easy stroll to all of downtown and the suburbs. This is a great location to go explore the John Day Fossil Beds. Do yourself a favor and go to the Dayville Cafe and have some pie. They have a list of 35 pies that that make and about 10 of those are served daily and they rotate. We will stay here again if we're in the area. We camped at Fish House Inn and RV Park in a Motorhome. John Day Fossil Beds, The Dayville Cafe. We only had pie but everything else looked pretty tasty and the pie was excellent!!!! This RV park is awesome! Beautiful, manicured lawns with large trees but able to get satellite with no problem. The owners are charming and keep this park immaculate. Very small park that is located in charming little town and be sure to visit ice cream shop next door for best ice cream ever! Spaces are very large and all back in. No problem for our 40' 5er. A definite must visit place! We camped at Fish House Inn and RV Park in a Fifth Wheel. This place is a real find. As others have said it is a charming little park with neatly trimmed grass and relatively large sites. All sites are back-in but they are very easy to maneuver into. Lots of trees but we were able to get a satellite connection from our site. Verizon works well, but there is no AT&T service. The park's wifi was ~3-4 Mbps which is pretty good. The parks roads and sites are gravel; the utilities were well place. The only criticism was that the site was high in the front, enough that our jacks didn't completely get us level. Not a huge issue, but it would have been easy to fix. The stated check-in hours are 4-8pm but I called and said I was going to be early and that wasn't a problem since the previous occupant had already left. The young owner is a pleasant person; the tiny little town is charming. We camped at Fish House Inn and RV Park in a Motorhome. The John Day Fossil Bed National Monument is close by (the Visitor Center and Museum). Thank you for your review and staying with us! 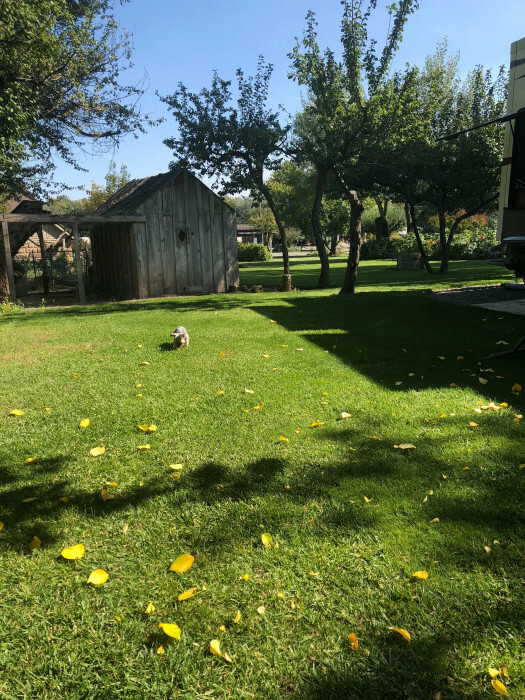 We stumbled upon Fish House Inn & RV Park on a drive through town and thought it was delightful. Even though there was a 'No Vacancy' sign for RVs (there was still availability in the Inn), my husband said, well at least ask! The owner came out and I sheepishly asked (because of the sign) and he said let me check the book, then said they had a small space that could accommodate our 25' motorhome with full hookups. It was in a lovely grassy area, right next to the restrooms and perfect. He could not have been kinder. It's a very tiny park but you can instantly see that the owners really care about their property and pay strict attention to the tiniest of details. There's a little shop next door with great sandwiches and ice cream. It's a charming little down filled with character. We'd go back and recommend it to anyone looking for a special little spot! We camped at Fish House Inn and RV Park in a Motorhome. This is definitely one of the best campgrounds we have ever stayed at. We used it as a base for exploring the two southern units of John Day Fossil Beds NM and it was perfect. The RV sites were long and paved and surrounded by thick grass. Most spots had some shade depending on the time of day. Bathrooms were spotless. WiFi was excellent. Verizon also worked well anywhere in town. We camped at Fish House Inn and RV Park in a Travel Trailer. Be sure to stop at the Dayville Cafe. The food, service and prices were all fabulous. We had four glorious days in this clean and friendly campsite. The owners were always around and available to answer questions, help with a problem or just have a friendly visit. They worked all day to make this an inviting and well-maintained oasis. From the camping to the "glamping" sites, to the rooms at the inn, this is a place for all kinds of vacationers to relax and refresh from the busyness of life. Outstanding and one of our all-time favourite campsites. 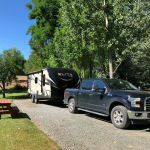 We camped at Fish House Inn and RV Park in a Fifth Wheel. The local cafe is celebrated online and justifiably so as the food was delicious, plentiful and served by a friendly, happy lady. The palaeontology museum was a great place for young and old. 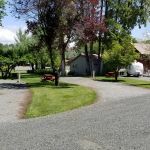 The RV Park is behind the Fish House Inn - just off Dayville's main street (Hwy #26). There are 6 spaces full W/E/S service. Spots are all 60' long and have level gravel parking pads with grass and trees between each space. Dayville is on Hwy 26, near the junction of Hwy 19, 32 miles west of John Day and 120 miles east of Bend. Pros: Small (6-site), reasonably-priced, full-service, RV campground with free WiFi. Immaculately-kept park with wide swaths of well-watered lawns - between and surrounding each site. On-sight owner is attentive. Fifteen-minute drive to Fossil Beds National Monument. Cons: Not a lot to see and do in Dayville: population 100, 1 restaurant, and 1 gas station/convenience store. Recommendation: Good CG for an overnight or several-day stay while exploring the area. 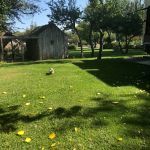 We camped at Fish House Inn and RV Park in a Travel Trailer. Fifteen-minute drive to Fossil Beds National Monument. This is one of my fav places ever. Maintenance is perfect. So quiet, and room between spaces. Chickens, ducks, quail, deer, so many animals moving thru, not to mention neighborhood dogs and affectionate cats. And a great cafe down the street, plus Halloween decorations. We come thru here twice a year and love it each time. 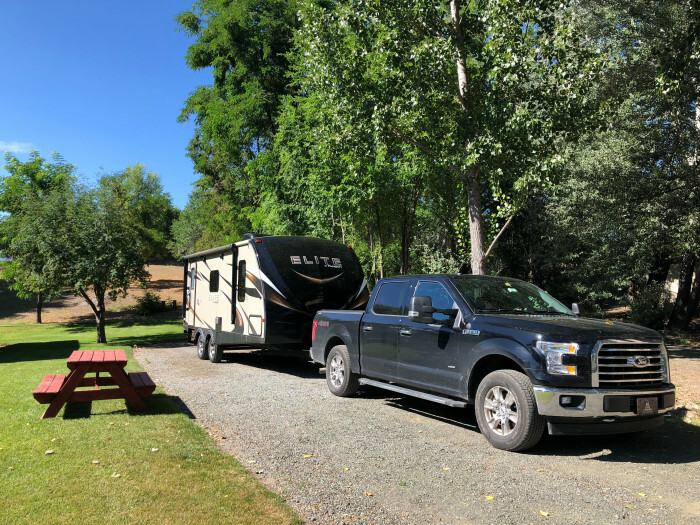 We camped at Fish House Inn and RV Park in a Fifth Wheel. Eat at the cafe, it is delish! What a GEM! Wonderful owners who are on site and keep the park immaculate. The park, although small, is easy to get in and around with our 40' Bus. Only 7 sites with full hookups. We were in #7 and I could get Dish with my Portable setup. Wifi was worked very good. Thank you for a great stay! We camped at Fish House Inn and RV Park in a Motorhome. Great Cafe close (try the pie) also general store, and coffee/ gift shop. John Day National Monument nearby. 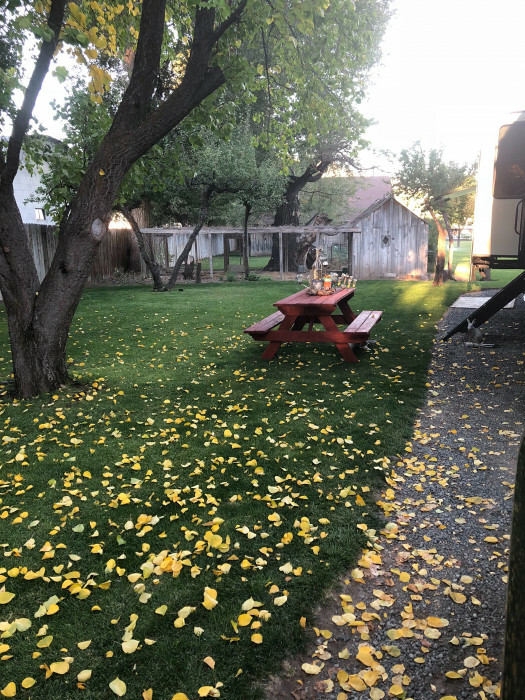 This is a pleasant campground with lots of foliage, well maintained landscaping and free range chickens seen eating squashed bugs off of RV front caps. All sites are back ins. Satellite TV was unavailable at most sites but might work at #6. Included WiFi was very good. There is no restaurant, fish house or otherwise, at the camp. The town has only two retail stores with limited stock. The Dayville Café, two blocks away, was a very good restaurant for such a small town. The John Day Fossil Beds National Monument is nine miles up the road, has beautiful and varied geological formations and is well worth a full day. Trails are mostly easy. Going west from I-84, filing stations are infrequent; fuel up in Ontario, particularly if you use diesel. We camped at Fish House Inn and RV Park in a Motorhome. We pull a 43' fifthwheel. This park is a gem. Entrance from the road is easily missed. Small park run by owners who are just lovely people. This is a very pretty well kept park behind a small inn. Lane is gravel. Sites are gravel and nicely spaced with nice grass areas between. Utilities are well positioned and work well. WiFI is excellent. There is no cable but our satellite worked well. No AT&T Cell service, dog park, pool or kiddy play area. Large grass areas for walking the dogs. Even with a lot of rain this Spring, we did not notice any bugs. Would definitely love to return and spend more time. We camped at Fish House Inn and RV Park in a Fifth Wheel. Walk to the Dayville Cafe to eat. Follow that with in-house made pie. Closest town for shopping is John Day about 20 minutes away. Folks drive into town for shopping. Be sure to allow at least one whole day to visit the John Day F0ssil Beds National Monument - amazing visitor center and sites. We love this place. 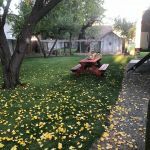 Stay to and from traveling to the SW. Sites are level, clean, neat, bathrooms are clean, there is a great cafe within walking distance, and much to see and do in the vicinity. Don't tell anyone, OK? We camped at Fish House Inn and RV Park in a Fifth Wheel. A true GEM in this very rural setting. There is local intermittent WiFi but no phone service and no HDTV or Cable. The CG is immaculate, grass sites with gravel pads. Almost like camping in someones backyard. Owner is host and great. Utilities are well placed and work well. Close to John Day Fossil Beds, Painted Hills and Sheep Rock Units, and great hikes. We enjoyed the time spent here and will definitely return when in the area. 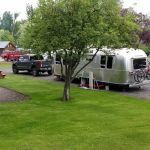 We camped at Fish House Inn and RV Park in a Fifth Wheel. One local mercantile and one gas station. One cafe in town well worth the stop. Excellent meals and easy pricing. Very out of the way but worth the stop and time spent in the Fossil Beds National Monument. This is a gem of an RV park. Only 6 sites but one of the best we have ever stayed at. All sites are gravel but level. There are full hook-ups for RVs and multiple tent spaces out on one of the well manicured expansive lawns. They have 2 large and very clean full bathrooms with nice showers. The laundry facility is clean and nice. The grounds look like a very nice large back yard. Fruit trees, berry bushes and grapes are everywhere. The owner greets you on entry and is extremely nice and helpful. There is an outstanding cafe within walking distance and an ice cream shop next door. You must stop here if you are on highway 26. And this is the only place I would recommend in this area. We camped at Fish House Inn and RV Park in a Motorhome. Awesome cafe within walking distance that serves large portions and fresh pies. Most everything served is homemade. Walk to the Dayville Cafe for steak or hamburger. Follow that with in-house made pie - we had marionberry and rhubarb. - both were good. Be sure to drive to the Painted Hills unit of the John Day Monument (about an hour) and see the natural color pallet of the landscape. Take the time to drive to the town of John Day (about 30 minutes) and visit the Kam Wah Chung State Heritage Site. Painted Hills of the John Day NM is worth the drive. Great trail to the top of the ridge gives views of the entire area. Don't miss the fossil beds and the visitor center. We were not able to visit the old farmhouse but will the next time through. Don't miss the John Day Fossil Beds National Monument. The visitor center will blow your mind. 44 million years ago? Wow! Even the Mascall overlook just off Hwy 26 was impressive. Many interesting hikes nearby, very easy to challenging. The John Day River is beautiful. Are you affiliated with Fish House Inn and RV Park ?